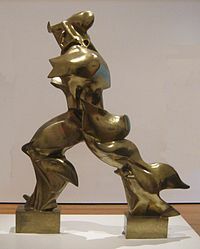 Umberto Boccioni, Unique Forms of Continuity in Space (1913). This work appears on the present Italian 20-cent Euro coin. The founder of Futurism and its most influential personality was the Italian writer Filippo Tommaso Marinetti. Marinetti launched the movement in his Futurist Manifesto, which he published for the first time on 5 February 1909 in La gazzetta dell'Emilia. This article was reprinted in the French daily newspaper Le Figaro on 20 February 1909. Marinetti was soon joined by the painters Umberto Boccioni, Carlo Carrà, Giacomo Balla, Gino Severini and the composer Luigi Russolo. One of the greatest patrons and financier of Futurism in Milan was the business magnante Antonio Bernocchi, he was also the creator and producer of the first example of Italian industrial design, inspired by futurism, that became known as "Luminator Bernocchi". The cover of the last edition of BLAST, the literary magazine of the British Vorticism movement, a movement heavily influenced by Futurism. ↑ Petrie, Brian (March 1973). "Futurism at the Royal Academy". The Burlington Magazine 115 (840): 196–198. ↑ "Umberto Boccioni: Unique Forms of Continuity in Space". The Metropolitan Museum of Art. Retrieved 2008-01-11. This page was last changed on 14 April 2019, at 01:24.